Mmmm the best thang to come from the south..Green fried tomatoes. Where are the pics of the final results? I can't tell much difference between this and fried simply because the low fat Mayo has just enough (zero trans fat) oil in it to give a kind of "fried" taste profile. Oh, yeah, I forgot ... sometimes I add a little grated Parmesan to the mayo to give it a more "Italian" taste. 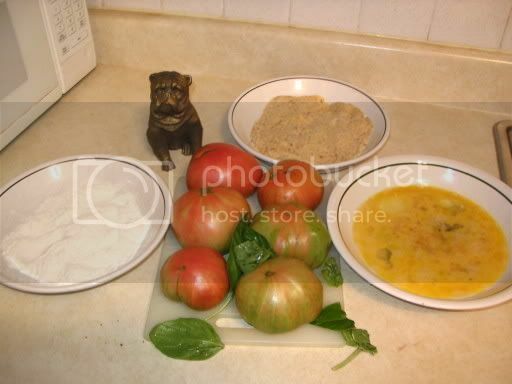 I hope you don't mind but I copied your recipe to the green tomato file. I don't fry stuff much anymore so your recipe is worth keeping. My pop's just had by-pass surgery and I need to start thinking more heart smart myself. I tried a fried green tomato recipe this past fall and they were good, but a little boring. So, with my next batch of green to near ripers, I cut them to the same thinkness, then cross-cut them, added diced jalapeno, onion and garlic, and mixed all that with the recipe's ammount of flour, salt and pepper and made some really good fritters. Now, for some dishes (like pasta sauce) I add diced green tomatoes to the carmelizing onions. Adds a nice twang. 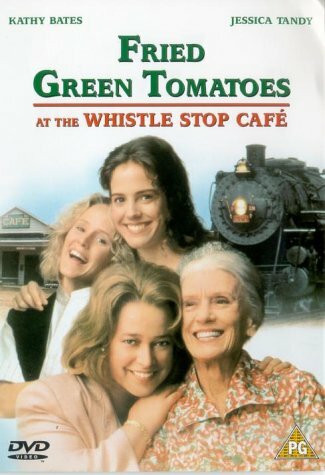 Don't forget how delicious a fried green tomato sandwich is! I love the tart, pungent taste. Super. I just fry mine the old way, dredged in corn meal, vegetable oil, slap them in the skillet, and it doesn't take long. Use good mayo and a little salt and pepper, WOW! Delish! Oh, and I'm a salt-aholic too! A variation on the traditional egg wash/breading is to simply slather the green tomatoes in mayonnaise, then dredge in bread crumbs or if you prefer, cornmeal. Then fry 'em up! Wonderful! I was always under the assumption that the cheese is added to the bread crumbs for breading, is there a reason you add it to the mayo? Does it work better that way? Does anyone have a recipe for this? Or does one merely dip in cornmeal? I've posted this before on the other site but I've been making my "fried" green tomatoes the same way as I learned to do for squash. A friend of mine has a grandmother with heart problems so they were forced to find some healthy alternatives since fried squash and tomatoes were eaten OFTEN throughout the summer. Much the same as the baked recipe above (which sounds excellent) and very easy. I preheat the oven to 425 or so. Spray a pan with nonstick stuff, place your sliced veggies. Salt, pepper, and sprinkle cornmeal over. Sometimes I put parm cheese or other seasonings for variety. Sometimes some sweet onion rings in with that too. Drizzle olive oil all over, not too much. Bake a little while, turn and bake a little while longer. I suspect they aren't as crunchy as true fried but if you eat them as often as I do it's supposed to be a healthier alternative. Actually, since Bully uses Canola oil, it's not all that bad, greasy, but a healthy oil. You could also use olive oil. The good oils are actually good for your heart, but not necessarily your waist-line, if you know what I mean. Baking/oven frying would mean less calories.